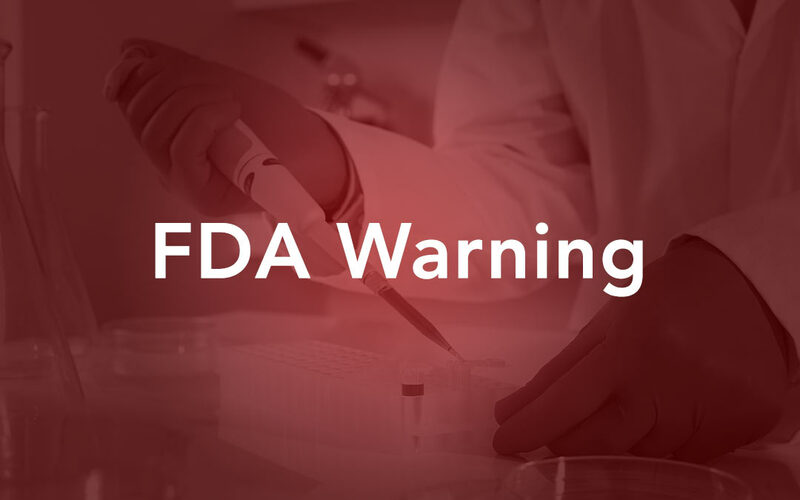 The U.S. Food & Drug Administration (FDA) has issued a warning letter to Cord for Life, an Altamonte Springs, Florida company that has sold umbilical-cord-blood products to stem cell companies. The FDA also issued 20 letters to companies instructing them to stop selling stem cell products that are not FDA approved. All IOF members should be aware of these FDA warnings and avoid using products that are not FDA compliant. For more information on IOF’s stance regarding birth tissue products, please click here to read a consensus statement from IOF board members and members. Click here to view a webinar of IOF President Gerard Malanga, M.D. discussing the statement. Click here to view the full FDA warning letter. Failure to establish and follow appropriate written procedures designed to prevent microbiological contamination of drug products purporting to be sterile[21 CFR 211.113(b)]. Your firm failed to validate the aseptic process used to manufacture PremierMaxCB® since manufacturing operations began in March 2018. By the nature of their routes of administration, your products purport to be sterile and are expected to be sterile. Operators were observed leaving and returning to aseptic operations in Biological Safety Cabinets (BSCs) without changing or disinfecting gloves. This practice of re-entering BSCs after touching papers, equipment, and/or utensils creates the potential for bringing contaminants into the BSCs. Operators re-using non-sterile smocks for up to 2 weeks. Gloves worn in the ISO 5 BSCs are non-sterile. Final drug product was observed in an open tray immediately adjacent to the exterior edge of the BSC. Between July and October 2018, 23 out of (b)(4) personnel fingertip monitoring samples were positive for microbial contamination with no investigation conducted or corrective action taken. During that same time, (b)(4) per (b)(4) test in BSCs (b)(4) and (b)(4) revealed gram positive rods, gram positive cocci, coagulase negative staphylococcus, micrococcus, and mold. 20 results were marked as passing; however, your firm failed to conduct an investigation, including further identification of the microorganisms, or document any corrective action. Viable air, surface and personnel monitoring in the BSC is not conducted for each fill. Such monitoring is only conducted (b)(4). The BSCs are cleaned prior to collection of the (b)(4) post-processing and fingertip samples. Therefore, the Environmental Monitoring (EM) samples are not representative of conditions existing during aseptic processing. There are no alert and action limits for EM in the ISO 5 BSCs. Any result less than (b)(4) Colony Forming Units (CFUs) is considered passing. However, the current industry standard is <1 CFU/m3 for active air sampling and <1 CFU/4 hours for settling plate action levels. This allowance for such high numbers of microorganisms could contribute to product contamination and pose a potential significant safety concern. For additional information, we recommend that you review FDA Guidance for Industry, Sterile Drug Products Produced by Aseptic Processing – Current Good Manufacturing Practice, available at https://www.fda.gov/downloads/Drugs/Guidances/ucm070342.pdf. Your firm failed to validate the cleaning process for your BSCs. Your Standard Operating Procedure (SOP) H.13 entitled “Operation and Maintenance of the Laminar Flow Biological Safety Cabinet” lacks adequate cleaning procedures for your BSCs (b)(4), including but not limited to, use of a sporicidal agent, frequency of reagents used, and contact times. Additionally, this SOP does not address cleaning between batches. Failure to establish written procedures for production and process control designed to assure that the drug products have the identity, strength, quality, and purity they purport or are represented to possess [21 CFR 211.100(a)]. Specifically, the manufacturing process has not been validated for your products. Failure to establish laboratory controls that include scientifically sound and appropriate specifications, standards, sampling plans, and test procedures designed to assure that components, drug product containers, closures, in-process materials, labeling, and drug products conform to appropriate standards of identity, strength, quality, and purity [21 CFR 211.160(b)]. You have not established specifications, standards, sampling plans and test procedures for testing your products for identity, strength, quality, and purity. Sampling for release testing is not conducted on final product. After sampling, the product (b)(4). The sterility test method was validated using a (b)(4), however, your (b)(4) system only (b)(4). Failure to establish and follow a written testing program designed to assess the stability characteristics of drug products and to use results of such stability testing to determine appropriate storage conditions and expiration dates [21 CFR 211.166(a)]. Specifically, you assign a three-year expiration date without supporting data. For further information about IND requirements for biological products, contact the Center for Biologics Evaluation and Research (CBER), Division of Regulatory Project Management, Office of Tissues and Advanced Therapies, at (240) 402-8190, or [email protected] Please include a copy of this letter with your initial submission to CBER. Your response should be sent to the following address: Daniel W. Cline, Compliance Officer, U.S. Food and Drug Administration, 19701 Fairchild, Irvine, CA 92612 or emailed to [email protected] If you should have any questions, please contact Daniel Cline, Compliance Officer at 949-608-4433 or via e-mail.